Design daylight with Helioshade ® HV80. 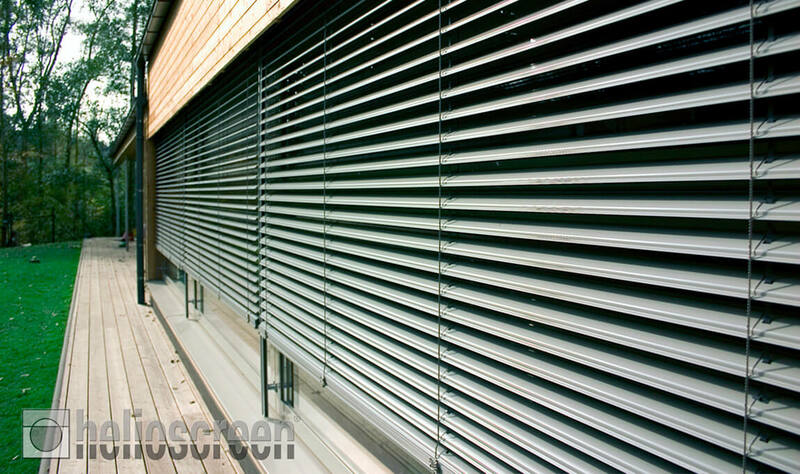 It’s the advanced external venetian blind system that provides optimal heat protection and unsurpassed light control. Perfect for domestic or working environments, the HV80 lets natural light and sunlight through whilst minimising uncomfortable hothouse effects and eliminating blinding glare. The elegant louvres can be set to any position and allow room temperature and light level to be perfectly matched to user requirements. When fully retracted HV80 provides a completely un-obstructed view. Featuring stylish 80mm curved louvres with rolled edges for extra stability, Helioshade HV80 suits any external façade and comes in a range of modern designer colours. Unaffected by extreme temperature changes, Helioshade HV80 external venetians reduce the sun’s penetration by up to 90% – providing huge air conditioning cost efficiencies. Whether you are an architect looking for a solution to help attain a Green Star™ rating for an office block or you’re conscious about your own needs in the home –the Helioshade HV80 has your environmental concerns covered. A new addition to the Helioscreen range, the motorised HV80 external venetian is practical and robust – satisfying the most ambitious design demands of modern architecture.